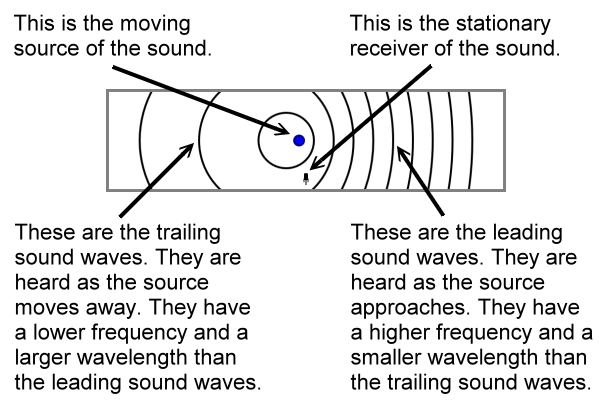 The Doppler effect is a change in the perceived frequency of a sound wave when there is relative motion between the source and receiver of the sound wave. This change in frequency is related to a change in wavelength. Here is an animation that demonstrates the Doppler effect. Please see more information below the animation. For example, you stand near the side of a road and listen to the sound of a car as it drives by you. The car is the source of the sound, possibly the tire noise or the horn. You are the receiver of the sound. There is relative motion between the source and receiver because you are standing still, and the car is driving first toward and later away from you. It is a common experience to notice that the pitch of the sound is different when the car is approaching than when it is moving away. The pitch of the sound drops as the car moves away. A low pitched sound has a lower frequency and a larger wavelength than a high pitched sound. The moving blue sound source emits sound waves at a constant frequency. The emitted sound waves are shown as black circular lines. These circles can be understood to represent the crests of the sound waves. The stationary black microphone is the receiver of the sound waves. It flashes green when it receives a sound wave's crest. The computer plays a snare drum hit sound to indicate when the microphone hears a sound wave crest. The wave crests moving to the right are smashed together because the moving source somewhat catches up with a newly released crest before it emits another crest. This makes the leading wave crests closer together than they would be if the source were standing still. Also, this smashing together makes more wave crest go by the microphone per second than would go by per second if the source were standing still. The total effect is that the leading waves have a smaller wavelength (the distance between crests) and a higher frequency than they would have if the source were standing still. The wave crests moving to the left are stretched out because the moving source moves away in the opposite direction from a new crest before emitting the next crest. Relative to the situation where the source were standing still, these trailing wave crests are further apart, and they go by the microphone less times per second. So, the trailing waves are increased in wavelength and decreased in frequency. Do not mistake the snare drum sound for the source's emitted sound. The animation produces a drum sound as a wave crest reaches the microphone. The purpose for this is so that you can easily sense the change in timing between wave crests as the source moves past the receiver. The drum sound is not meant to represent the actual sound that the source is making. It is simply an audio marker for your ears so that you can clearly realize that more leading crests go by the microphone per second than trailing crests go by per second. This indicates that the leading frequency is higher than the trailing frequency.